Narendra Modi and the BJP have placed the government's claims beyond question. 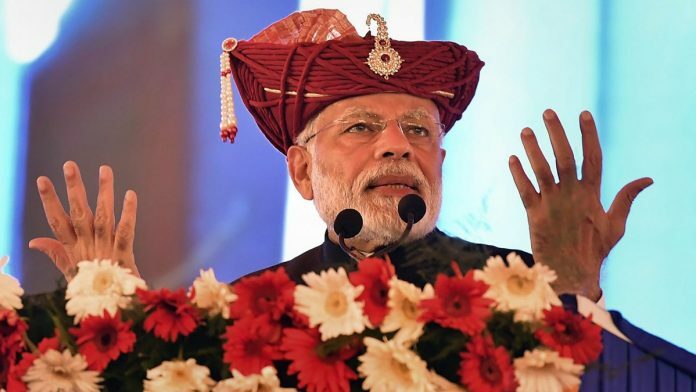 As the first of India’s 900 million eligible voters head to the polls on 11 April, Prime Minister Narendra Modi’s ruling Bharatiya Janata Party appears poised for re-election. A recent opinion survey by the Center for the Study of Developing Societies shows Modi’s popularity recovering sharply from a recent slump and returning to its high levels of two years ago. A poll by Firstpost-IPSOS pegs Modi’s approval rating at 63 per cent, or four times higher than the 16 per cent his putative rival Congress president Rahul Gandhi garners. We ought to take all polls with a grain of salt. They’ve often been spectacularly wrong in the recent past. Nonetheless, the CSDS and IPSOS surveys jibe with what I found on a recent trip to Delhi and the Hindi heartland state of Uttar Pradesh. Among the dozens of voters I interviewed — most of them Hindi speakers — the vast majority held a favourable view of Modi. They also felt that Gandhi was not yet ready for prime time. In my most recent Wall Street Journal column — read it here — I argue that a recent spike in tensions with Pakistan has bolstered Modi’s image as a decisive leader and stolen the opposition’s momentum. The national conversation has shifted from a lacklustre economy to a purported military triumph. That Gandhi effectively wasted three months banging on about a defence deal rather than focusing on unemployment and agricultural distress has not helped his party’s cause. We’ll know on 23 May if Modi is indeed coming back to power. But if he does return, part of the credit will surely go to his ability to place his government’s claims beyond question. With nationalist sentiment surging, the BJP has effectively created an echo chamber where any scepticism about the government’s purported military achievements is treated as virtually treasonous. Three quick examples will suffice. On the Balakot airstrikes, satellite imagery analysis by the Australian Strategic Policy Institute, among others, suggests that the Indian Air Force missed its target, a Jaish-e-Mohammed training camp. A recent article by Foreign Policy’s highly regarded Pentagon correspondent Lara Seligman casts doubts on Indian claims that it downed a Pakistani F-16 in a dogfight on 27 February. Citing unnamed Pentagon officials, Seligman says “U.S. personnel recently counted Islamabad’s F-16s and found none missing.” On Twitter, the Economist’s defence editor Shashank Joshi contradicted shrill comparisons of India’s successful anti-satellite missile test last month with its first nuclear test in 1974. Other analysts questioned the military significance of the test. My intent here is not to argue one side or the other of these cases. (I’ve previously pointed out that the details of Balakot in fact matter less than the fact that India showed a willingness to retaliate against targets in mainland Pakistan for a 14 February suicide car-bombing in Kashmir.) At this point, Indian journalists and analysts have produced scores of stories essentially corroborating the government’s view. And it’s certainly possible that the sceptics are wrong and the Indian authorities or the BJP are right, though it ought to be noted that in each case one side comes across as a disinterested observer dispassionately sifting evidence while the other comes across as a lawyer determined to prove a case without a shadow of doubt. Whatever the truth, when it comes to what most Indians seem to believe this is not even a contest. Bluntly put, the experts are whistling in the wind. For the most part, the Indian media parrots the official line on military-related matters, and the rare journalist or expert who falls out of line immediately finds his patriotism or financial integrity impugned on social media. Add to this embellishments peddled on WhatsApp and YouTube and there may be no point trying to sift facts from fiction. Most people want to believe the most heroic version of the story — that Indian aircraft took out 250-300 Pakistani jihadists in a precision strike, and that an aging MiG-21 downed a more advanced Pakistani F-16 fighter. They will not be denied the pleasures of certainty by some pesky pointy-headed foreigners. Fourteen years ago, the comedian Stephen Colbert coined the word “truthiness,” which the dictionary defines as “the quality of seeming or being felt to be true, even if not necessarily true.” In India, “truthiness” appears to be the flavour of the day. It’s one reason why the BJP ought to be quietly confident about returning to power next month. This article was originally published in American Enterprise Institute. I am highly skeptical of foreign based or foreign educated experts. The author says both sides have put forward their cases. He also does not seem to know that their are other military & satellite imaging experts who have given their counterpoint to the Australian report. In addition, the author fails to mention the fact that Pakistan has not allowed any journalist to visit and verify both the Jaish strikes and the site of the F-16 & MIG-21 crashes since both fell in POK. Without anyone actually inspecting the crime scene itself, how can journalists & foreign experts claim that both events never happened when Indian military records are clear on the matter? This is not an objective article, by any means. The author is clearly biased. Firstpost itself had put up an extensive article written about the F-16 & MIG-21 fight and the electronic & visual evidence from the Indian side. I have read the complete article. Even though I am not a military expert, I am still knowledgeable about military matters and I am a scientist myself to understand the rationale presented in the article. I wish FIRSTPOST would forward the article to this particular author before he writes articles like this. No one is asking him to shut up but if he is of a stature as to be asked to write an article, he better have his facts right or atleast gather all the evidence, analyse the preponderance & probablities and then, finally pen the article. The way this article is written only shows the laziness of the author. Maybe he received an assignment and without going anywhere or verifying any information, as true journalism requires, he maybe spent 20 minutes and blurted out this article. The echo chamber remains restricted to TV studios. We have yet to see it overcome the heat and dust of a general election. The final result would be known on 23rd May but crystal ball gazing is the name of the game today. The underlying thought process among most undecided Indians is if the present PM needs to go, who is his alternative among the smorgasbord of opposition leaders?? This point is relentlessly drilled by the BJP. The challengers are many, albeit, regional satraps. Congress is a pan India party but is unlikely to receive support. And in the event that they don’t secure a working majority, they are confronted by uncertainty. Speaking of facts, if the author has doubts about Balakot strike then let him ask Pak authorities to take him to Jaba top, so that he can confirm the veracity of these strikes himself, rather than naming some foreign journalists or so called experts. I doubt he will get any response from Pak authorities for such a request. Further also go and ask Gafoor of ISPR, the whereabouts of the other pilot who was supposed to be admitted to a hospital as per his initial claim on 27th Feb, and then conclude for himself whether or not an F16 was shot down or not.